Distribution transformers are not usually fitted with overall differential protection and so it is necessary to provide overcurrent protection. The relays are generally of the induction type with the usual inverse definite minimum time characteristic. The advantage of using this type of relay is simplicity but it has relatively high settings and long clearance times. If the possibility of phase faults within the transformer are considered to be remote then this may be acceptable, otherwise the risk of damage due to slow clearance times and the restricted amount of winding protected constitute serious limitations. Overcurrent protection does, however, provide suitable back-up protection and here its characteristics are no disadvantage and as such it protects the system as a whole. In many installations it is used as primary protection for the LV busbar. Mounted in the same case as the IDMT overcurrent relay is an instantaneous relay which takes advantage of the change in fault level between LV and HV sides of the transformer. Fig. 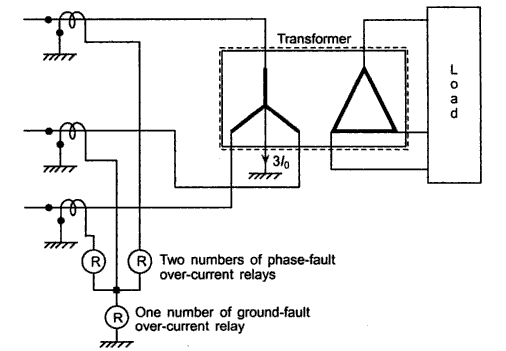 1 shows two numbers of phase fault over-current relays and one ground-fault over-current relay for providing over-current protection to the star-delta transformer. Such a scheme may sever the purpose of providing either the primary protection for smaller transformer or the back-up protection for bigger transformers. The pick-up value of the phase-fault over-current units is set such that they do not pick up on maximum permissible overload, but are sensitive enough to pick up on the smallest phase fault. The pick-up of the earth fault relay, on the other hand, is independent of the loading of the transformer. The neutral current under load conditions is quite small. The neutral current is essentially because of load unbalance. It is interesting to note that the third harmonic currents, in particular and triple-n harmonics (harmonics of order 3, 6, 9,...) in general, which arises due to distortions introduced by electronics loads, also end up as zero sequence currents and flow through the neutarl. The impedance of a transformer is determined during the short-circuit test. In the transformer manufacturer's works two tests are conducted on all transformers. The open-circuit test in which nominal voltage is applied to the transformer on no-load. The current, (the magnetising current), and the power input are measured. The power input is virtually the iron losses as current, and therefore the copper losses, are low. across the primary winding to produce full-load current. If the nominal voltage was applied to the primary winding with the secondary winding short-circuited the current which would flow in the transformer would be 100/6= 16.7 times full-load current. Therefore any fault on the secondary side of the transformer cannot be greater than this and so if the high-set relay was set to operate at a value higher than 16.7 times full-load current it will not operate for a fault beyond the transformer and will therefore discriminate with all protection on the system beyond the transformer. The fault level on the HV side of the transformer will be far greater than the setting current and so this fault will be cleared quickly. The instantaneous operation of the relay is also important in time graded overcurrent schemes. If there was a ring system on the LV side of the transformer with relay settings producing relay operating times of 0.5, 0.9 and 1.3 s, then the transformer IDMT relay would be set to operate in 1.7s, and any IDMT relay between the transformer and the source of supply would have to be set to operate in 2.1 s. With a high-set relay on the transformer the setting of this relay can be reduced to give an operating time of 0.5 s at the maximum fault level.